A meeting was convened of the priesthood of Calcutta at the house of Archbishop Henry D'Souza in 1986 to discuss the arrangements to be made for the impending visit of the Holy Father to the city. It was, I suspect, at the instance of Fr. Albert Huart, S.J., the Rector of St. Xavier's College, that I found myself to be an improbable participant at that meeting, a Xaverian representing the laity in that august sacerdotal assembly and a Mussalman to boot. It was decided that there would be two functions, one for distinguished citizens of Calcutta on the grounds of St. Xavier's and the other an open air mass in the maidan area. There were to be two other functions, which will be unfolded presently. These decisions having been taken, and announced, silence followed. I asked in all naivety who would plan and organize these rather ambitious functions. The question seemed singularly inapposite. The silence to which I have alluded was eloquent: was it not for this very purpose, it seemed to say, that I had been invited to the sacerdotal proceedings? I accepted the onus with a brave face and at once opted for an opposite number among the priests who would liaison between me and them and my choice of that opposite number naturally fell on Father Huart. The venue for the open air mass had to be decided upon. I pitched for the Brigade Parade Ground. Immediately, there was opposition from the police who said that the use of that ground had never before been allowed for a religious purpose. I took this debate to the only level at which it could be definitively resolved: Jyoti Basu, the then Chief Minister, himself a Xaverian of no mean repute. My argument, meant to strengthen Basu's hand, was that the mass was to be regarded as a public meeting presided over by a head of state, who, by coincidence, happened to be the head of a religious order also. Jyoti Basu's reaction was typical: "amra to oder school-e podechi, oder mass etadi shomonde jani ' (We have studied in their schools; we know about their mass etc')". That proved conclusive. More on the subject was not said. The battle for the Brigade Parade Ground had been won. I entrusted to Moloy Chakrabarty, the Chief Architect of the Housing Board, the responsibility of designing the podium of the St. Xavier's function and of the mass. In the event, exquisite plans were prepared. The next question arose regarding the funding of these projects. I argued before Jyoti Basu that the responsibility for making security arrangements for a visiting Head of State (and the Pope was the Head of the Vatican State) was that of the state government and suitable podiums from the security angle would have to be constructed for the two papal events. This argument could not be rebuffed and the requisite money was sanctioned. Thus it was that a Marxist government defrayed the expense for the visit of a Roman Catholic Pope at the instigation of a devout Mussalman. My engineers in the Public Works Department constructed the two podiums which had been designed by the Chief Architect of the Housing Board. While I was supervising the construction of the podium at the Brigade Parade Ground and explaining a point to senior police officers present there, an unknown photographer was recording the proceedings on film. Father Huart sent the resultant photograph to me with the inscription, "Napoleon at Austerlitz". At some point in the above proceedings, I discovered that prior to coming to St. Xavier's to meet the distinguished citizens of Calcutta, the Holy Father would be visiting Mother Teresa's Home for the dying at Kalighat -- Nirmal Hriday. On some inspiration, I thought it necessary to check with Mother Teresa what arrangements had been planned for Nirmal Hriday and whether anyone had been designated to attend to them. She said that she did not have a single clue about all this. So willy-nilly, I took upon myself this responsibility ' that of the third function - and put Mother Teresa through her paces. I rehearsed with her every step that would be traversed by the Pope on alighting from the "Popemobile", through the premises of Nirmal Hriday, up to the podium to be erected by my engineers in front of these premises (for addressing the crown that was bound to collect) and finally back to the "Popemobile". After doing this exercise a few times to satisfy myself that she had learnt the drill and knew precisely what was to be done, I was tired, when she gently enquired of me: "Perhaps we do this one more time?". Things went without a hitch at Nirmal Hriday. Four destitutes picked up from the streets had died in the morning. The Pope spent some time at the mortuary to bless the bodies (which he did by placing his hand on their heads). As anticipated, a sizeable crowd had gathered outside Nirmal Hriday and the Pope addressed this crowd. The official Vatican photographer recorded the event and the Vatican sent to Mother Teresa in due course a photograph showing the Pope and her, with me featuring somewhere around. 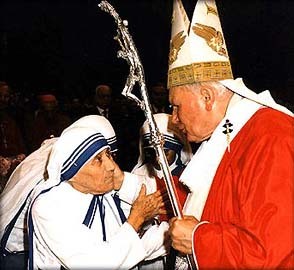 She sent this photograph to me with the following words inscribed on its back: "God love you for the love you gave to the Holy Father during the visit to Calcutta. God bless you." The roads to Nirmal Hriday and from there to St. Xavier's were packed with all kinds of people, not Christian or Catholic, intent on having a glimpse of the Holy Father. One lady told me that her hair stood on end as he passed by. There was something in the air about him to have affected her ' and perhaps countless others ' in this way. Things also went without a hitch at St. Xavier's, where thirteen thousand guests had gathered to greet the Pope. I was the Master of Ceremonies at the function. To promote the ambience, I played on the public address system a selection of music from my archive that testified to my piety, e.g. Leontyne Price singing Ave Maria accompanied by the Berlin Philharmonic Orchestra under the baton of Herbert von Karajan There was also a live presentation of devotional songs ' a quawwali sung by Manzur Hassan and songs in Bengali by Suchitra Mitra. When the Pope arrived, he was escorted to the podium. The West Bengal Government was represented by the late Jatin Chakravorti, the then Minister, Public Works Department and the citizens by the Mayor of Calcutta. Then there was the Archbishop of Calcutta and leading members of the Pope's entourage. I remember I had to draft the Minister's speech, but I had no time for this as I had to attend to numerous other details. I, therefore, entrusted this work to Dipak Rudra, a Xaverian, who wields a facile pen. In the upshot, the Minister's speech was appreciated by a discerning audience for its literary merit. Gifts were presented to the Pope on behalf of the citizens. In retrospect, a comic interlude ' at the time, it infuriated me no end ' occurred: a Bengali gentleman took his time presenting his gifts, then attempting to exchange civilities and at last producing pen and paper to record the Pope's autograph! No further disaster occurred thereafter. The Pope finally delivered a thoughtful address and concluded by blessing the gathering. The mass was held the next day with one hundred and one priests concelebrating. According to police estimates, about four lakh people attended the mass, and many among them would be non Christians. And once again the event went by without a hitch. And so it was time to take leave of the Holy Father, but not before a small business had been transacted. The Catholic priests thanked me profusely for everything I had done to make the Pope's visit a success. I told Father Huart that there was no such thing as a free lunch and I expected a price to be paid for my labors. Somewhat startled, he enquired what might that be. He was greatly relieved when I said that a private audience with the Holy Father for me and my family was the price I would exact. Father Huart, I think, spoke to Father Tucci, a Jesuit priest in the entourage of the Pope looking after the details of the visit, and a private audience was duly arranged. This completed the tally of four functions to which I alluded in the beginning. The late Kamalesh Roy, Joint Commissioner of Police, Calcutta asked me whether he could not be introduced to the Pope. I promptly asked him and a few other senior officers like D.C. Vajpei and T.A. Khan to come to the Archbishop's House, where the Pope was staying, at 7 a.m. on the date of his departure and shake hands with the Pope. They came at the appointed hour. And then I said to myself, why not the Sergeants, constables and the Military Police motor cycle outriders? They had done duty silently. So all of them were made to line up ' the line stretching from the Archbishop's House well into Park Street - and I introduced all of them to the Pope when he came out of the House. Some sergeants in full uniform ' all Hindus ' prostrated themselves in obeisance and did pranam before the Holy Father. Such was the eclectic power he exuded. As a post script to the events which I have narrated, I must add a poignant episode. Father Huart conveyed to me Mother Teresa's wish to see me. Accompanied by my daughter, Shaiqua, I went to Mother House one morning on my way to Writers' Buildings. Father Huart was already there. She came, bearing a small packet in her hand. After some chit chat, she handed me the packet, saying that I deserved it more than she. Without thinking about it, I put it in my pocket and forgot all about it till I returned home in the evening. When I opened it, I was surprised to find the gold medallion that the Holy Father had given her on his visit to Nirmal Hriday! I had received quite a few silver medallions on the various occasions I met the Holy Father, but no gold came my way. This deficiency was made good by the Mother, who is, alas, no more with us. She was beatified by the Holy Father not long ago and now expects to be canonized. Recounting the past in small anecdotes is so very important and informative that has been wonderfully portrayed in these columns. History is knowing the past in small details amidst a large canvas. Thank you. Was long waiting for such an account. I had a glimpse of the Pope from the first floor verandah of the College through the brass binoculars of Rev. Fr. D' Souza who was then the Principal. The binoculars actually belonged to Rev. Fr. Bonham, as Fr. D'Souza told me later. Prior to the event, I do remember the author frequenting the premises of the College, thumping up and down the stair-cases, in his safari and conferring with Rev. Fr. Huart; perhaps the details of the programme which we feel is still one of the best ever organised in the heart of Calcutta. The silent humour of Fr. Huart was resounding; a sample of which has been penned by the author. He was a student of Dr. Sarvapalli Radhakrishnan in Oxford and was an accomplished theoritician in Philisophy, Politics, Religion, Logic and Ethics. He was one of the few who delivered lectures in different seminars when the bi-centenary of the American Constitution was being observed in Calcutta during 1988-89. One such seminar was in Ramakrishna Mission Institute of Culture, Gol Park; being presided over by Swami Lokeswarananda, then Secretary of the RMIC. The Bengali magazine "Desh" had one number with Fr. Huart featuring on the cover-page and few central articles, including an interview which was taken by Tanaji Sengupta.Fr. Huart's simple, scientific and precise interpretation of Secularism in various Constitutions and Charters and its practice along with his comparitive study of different political ideologies still remains embedded. So were his discussions on Liberty, Dictatorship, Rights and many more topics. Whosoever came into contact with this French-speaking Belgian Jesuit will find it impossible to forget him in one's lifetime. My sincere and hearfelt gratitude to Shri Murshed and "boloji" for providing me the opportunity to relive golden past and offer my reverence to one who has shaped me as have my parents.